AVG Protection Pro is a robust collection of security tools that ensures protection against the increasing number of digital threats for multiple platforms, specifically Windows, Mac OS X and Android. It bundles a full-featured set of security modules, so users can easily enable antivirus and antimalware protection on their devices with the possibility to perform remote scans and manage all devices from a single dashboard. 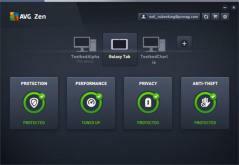 AVG Protection Pro includes AVG Internet Security, AVG AntiVirus for Mac, AVG AntiVirus for Android, and AVG Zen. AVG Internet Security bundles powerful features like password-protection, file encryption, anti-spam, an advanced firewall and download scanning capabilities. AVG Zen is the unified dashboard that lets you manage all your AVG-protected devices from one place, as well as add new ones with ease. If you want to connect a new device to your AVG account and enable protection for it, the invitation will be sent via email and you only need to enter the automatically generated code. Thanks to AVG Zen you can conveniently perform remote scans for any connected device, plus you can access AVG Internet Security from the same dashboard. With this robust security solution, you will benefit from real-time protection that will keep your computer or mobile device safe against malware, viruses, spyware, rootkits, Trojans and other threats. What’s more thanks to AVG Internet Security you can rest assured no online threats will be able to infect your computer, as it automatically scans any link you attempt to visit. There’s no compromise on privacy and email protection either, plus the module also bundles a robust firewall to ensure you can safely perform shopping and banking online.